The signing of the Comprehensive and Progressive Agreement for Trans-Pacific Partnership (CPTPP) took place last week, but questions now loom over the status of the Regional Comprehensive Economic Partnership (RCEP). The RCEP recently progressed to yet another ministerial meeting on 3rd March, after which it was reported to be closer to finalisation. "The Ministers welcomed the advancement of the text negotiations and noted that some chapters are nearing conclusion, in addition to the two concluded chapters on Economic and Technical Cooperation and on Small and Medium Enterprises," said a joint media statement that was released after the meeting. Other areas covered by the RCEP include trade in goods and services, investment, economic and technical cooperation, intellectual property, competition, dispute settlement and e-commerce. It does not, however, contain protectionism clauses for intellectual property, labour rights and environmental standards. RCEP member states include ASEAN, Japan, South Korea, China, India, New Zealand and Australia. While Singapore expressed an intention to conclude RCEP trade talks by the end of 2018, Lim Hng Kiang, Singapore’s Minister of Trade, stressed that this was not a deadline to reach at all costs. Negotiating parties were told to improve their market access offers as well as table a revised offer for services and investment in time for scheduled meetings in the near future. 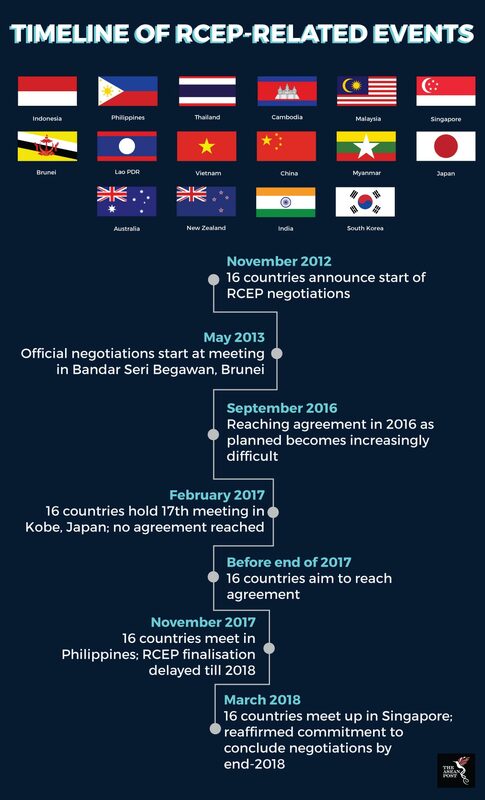 Since negotiations began in 2013, three deadlines to conclude the RCEP have already been missed. The delays have been attributed in part to differing interests, but this is also due in part to the difficulty of bridging more mature, developed markets such as Japan and Australia, with less developed ones such as Lao PDR and Cambodia. “If it is just us ASEAN countries, we have no problem concluding RCEP because we have existing FTAs with the other six negotiating countries,” commented Cerefino S. Rodolfo, Philippines Trade Undersecretary Jr to the Business Mirror. “The problem is with China, New Zealand, Japan and India because they have no FTAs among them,” he added. India is one member state that appears to be dragging its feet. It is being pressured to commit to zero tariffs on 92% of items for all RCEP members including China. Yet analysts say that India is only likely to benefit from the RCEP if it gets heavy concessions for services in return. India is now proposing for zero tariffs on its goods to apply to just 80% of all tariff lines, with a deviation of 6% either way. “RCEP without India will indeed dilute the economic and strategic value of the agreement, and offer China an opportunity to advance its own agenda of an East Asia Economic Community involving ASEAN and the three North Asian countries,” wrote Dr Sanchita Basu Das from the ASEAN Studies Centre of ISEAS – Yusof Ishak Institute in an opinion piece. Meanwhile, the benefit to ASEAN nations is that a single RCEP would not only plug existing gaps within current bilateral agreements, but also help to fortify current trade relations with its Asia Pacific partners. The RCEP will also prevent the interests of individual ASEAN member countries from diverging in different directions, should they merely partner with RCEP nations on a bilateral basis. Under a single unified trade agreement, ASEAN interests can be looked after as one integrated whole. China, which is pushing for quick resolution of the RCEP is seen as the biggest beneficiary from the RCEP so far. Being a part of the RCEP would enable it to wield wide economic influence in the region, while being able to access emerging markets on a much more liberal scale. Yet even for China, the RCEP would simply represent one avenue to for it to deeper integrate itself within the Asia Pacific geopolitical agenda, in addition to the CPTPP and the Belt and Road Initiative. It is still too early to tell what the final outcome of RCEP negotiations will be, or when negotiations will be concluded. Yet there seems to be enough momentum in the Asia Pacific region to push for these issues to be ironed out quickly. How the signed CPTPP pans out might also have an impact how RCEP parties negotiate their interests, moving forward.